Schiavone spoke to students about her mission to make a change in the world and not be attached to the stereotypes that come along with different disabilities. Her organization brings information, support and guidance to families who have given birth to a baby with Down syndrome. During the last 18 months, she has sent more than 600 baskets around the United States. The baskets are filled with baby items such as onesies that read “downright perfect;” rattles, headbands, hand knitted blankets, sweaters, hats and booties; resources and information for the parents; and a message from Brittany’s parents about the journey of raising a child with Down syndrome. Sheri Fallacaro, National Junior Honor Society adviser, was one of her former teachers and organized the presentation for the middle school students. The National Junior Honor Society members also donated items to help fill up more baskets. 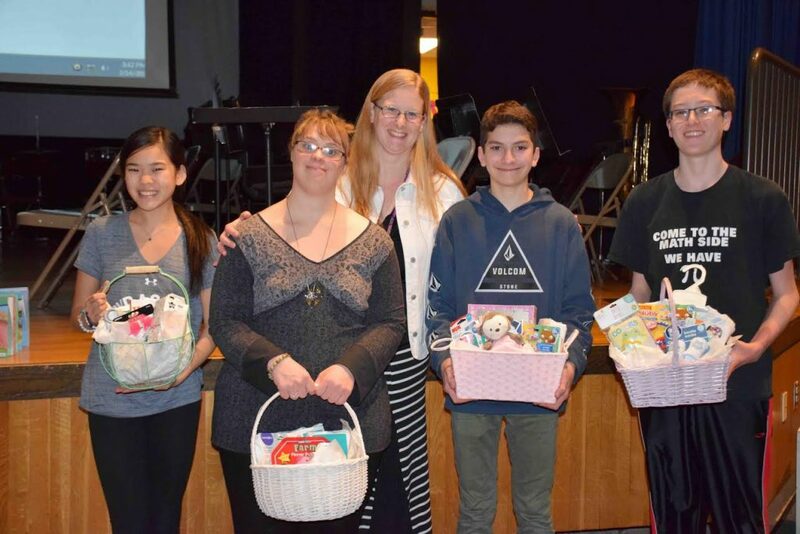 Photo caption: Brittany Schiavone, an entrepreneur with Down syndrome, visited with National Junior Honor Society students at Accompsett Middle School in the Smithtown Central School District on March 14.